Friday, Maerz Contemporary art gallery in Molde opened an exhibition called ‘Urban 2018’, with works of local and international artists of urban art/street-art. Urban art is a style of art that relates to cities and city life often done by artists who live in or have a passion for city life. In that way urban art combines street art and graffiti and is often used to summarize all visual art forms arising in urban areas, being inspired by urban architecture or present urban lifestyle. As many urban artists, locals Martin Kristensen (works under nickname Rabagast), Sivert Bjørnerem and Henrik Sæther have started from the graffiti on the street walls when they were teenagers. Eventually some of them not only dedicated their lives to it, but also to doing it professionally. Locally and internationally modern urban artists tend to have an academic background. And this is one of the features of modern urban art compared to street style. 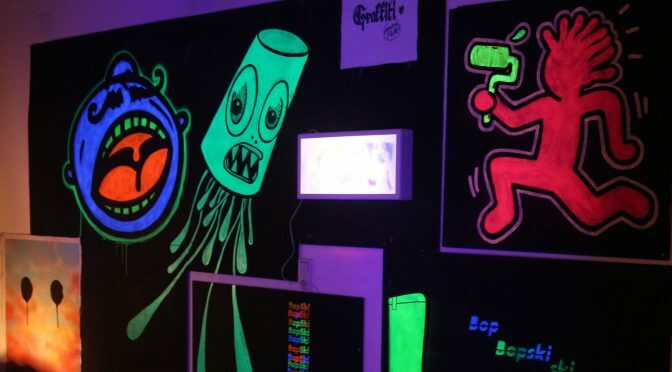 Unlike traditionalists, urban artists use ultraviolet paints, spray, metal and lacquer to produce their works. We never know if it becomes a classic someday, but it has a strong international movement nowadays. “This is really something different in Molde,” one of the guest at Maerz exhibition opening said. Molde citizens and guests can enjoy international and local works of urban artists at Maerz Contemporary every weekend between 12 and 15 PM until March 3rd. Prices for exhibited objects range from 3000 till 27000 kroner.